Descending like storm troopers onto the deck – but in black and on horseback – the police stormed in on an aboriginal island community on Heirisson Island on Friday morning, stealing their property and herding aboriginals off their homeland. Videos have sprung up showing police voluntarily (or should I say complicity) and illegally evicting people off their land on Heirisson Island. Eviction without fair cause is considered criminal in most States. 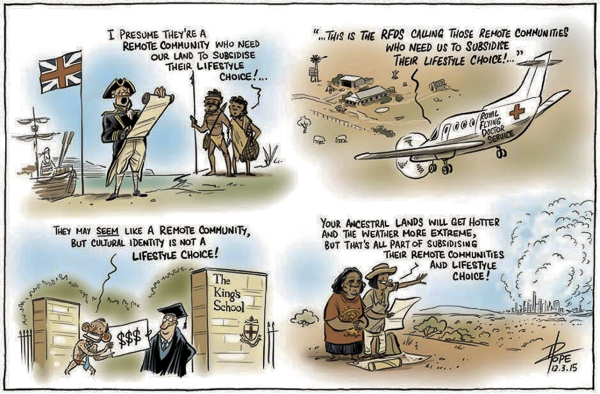 What legislation unbeknownst to the traditional owners has the Western Australian or federal government enacted to be able to remove people from the land that they own? Is the government’s declaration that they were “squatting on their own land” now considered fair grounds? Does not the absence of support of the courts cause curiosity? It is surely ironic (not the least to say, excessive) that the police would come as mounted troopers to clear them out! 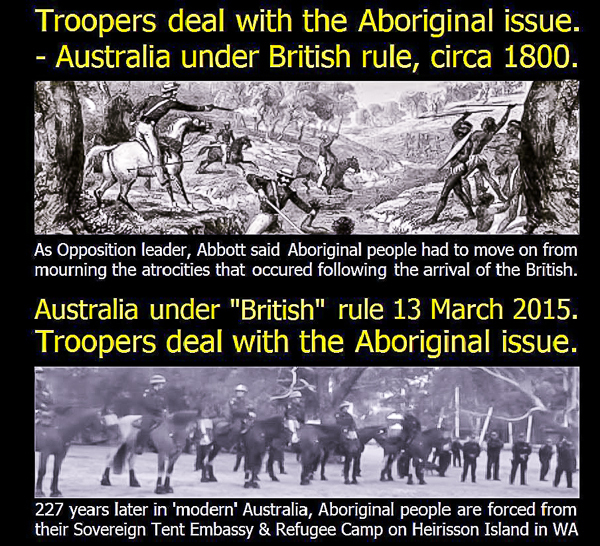 Especially for anyone who is aware of the violent early history of Australia about suppression by “authorities”. A friend of mine in reaction to a meme I posted about Tony Abbott’s statement that we are “sick of being lectured to by the United Nations” said, “… we can’t afford to care for our own marginalised people, let alone introducing extras“. After some responses to that pointing out the fraudulent nature of ours claiming national poverty for the 14 wealthiest nation (regarding gross domestic product per capita in IMF$,) in the world (Yes, Australia) with the third lowest gross debt to GDP of any country in the OECD. I finally said, “What we can’t afford, Alice, is continuing to pay for the ultra-rich!” And this latest Abbottism about “lifestyle choices” for “our own marginalised people” (i.e. 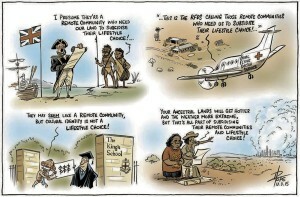 Aboriginals) shows a similar lack of insight into wealthy versus poverty based lifestyle choices. Abbott’s statement is hypocritical at best but more probably just another “lie” of misdirection to victimise the marginalised to facilitate the wealthy to take advantage. The only other thing the land these aboriginals are on is useful for (outside of occupation by “real Australians”) is either agriculture or mining. Let’s not forget that the Mining industries are significant donors to the Liberal Party. Guess who wants it? Who’s “lifestyle choices” are we supporting now Mr Abbott? 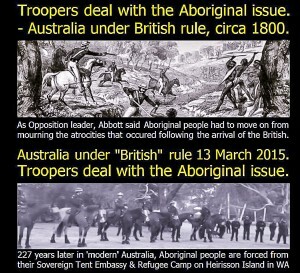 Waging war against aboriginals and their rights to their land – for the benefit of wealthy exporters seeking to mine that land – is, I would assume, an act considered despicable by Australians that acknowledged their apology for white man’s mistreatment less than a decade ago.